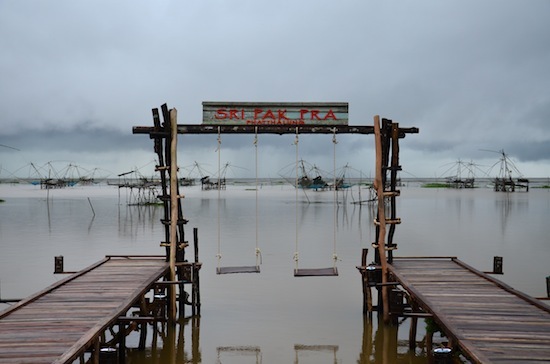 Where the Pak Pra Canal empties into Songkhla Lake, dozens of stilted fishing platforms support wide nets strung to logs that are dipped into the fresh water for fish. In these spider-like tangles, the designers of Sri Pak Pra Resort found inspiration for a property that blends seamlessly into the particular beauty of the setting. If you seek an unforgettable place to stay near Thale Noi and are travelling with a vehicle, Sri Pak Pra will not fail to please. Who’s up for a swing? 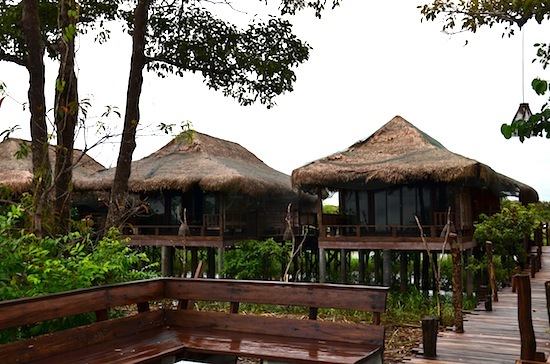 Almost the entire resort stands on wooden stilts over the shallows, connected by a network of raised wooden walkways. 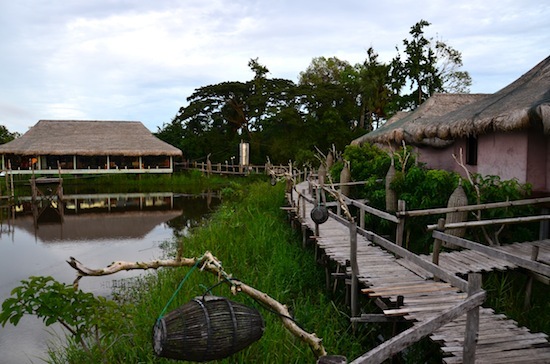 Five standalone villas with direct lake views join five superior rooms situated in a longhouse beside a mirror-like pond. The only concrete we noticed is used for exterior bathroom walls and the stilts that hold up the villas. Left unharmed during construction, several tall trees poke through a huge common deck that culminates at a pair of swings set up over the water. Birds twirl among the branches as fish and reptiles swim within view. Those are the superiors on the left. The spacious villas are gorgeous, inside and out. Dried thatch leaves top vaulted wood-frame ceilings. Wood-plank floors were sanded to the point that you could put on a pair of socks to play hockey. Desks and daybeds with numerous silk cushions in warm oranges and reds are joined by mosquito nets, fridges, hot-water kettles and enormous slate-wall bathrooms next to dedicated changing rooms. Private and with plenty of space, wooden terraces have wide chill nooks set up with huge pillows that you can sink into for hours. Nearly wall-size glass doors allow guests to watch the sunrise from bed. Smaller superior rooms have a similar design, but the villas are well worth the extra cash. The resort also offers a generously sized honeymoon villa on a private corner of the property; get in touch well in advance and expect to pay a premium if interested. The superiors and especially the villas represent excellent value for all that you get, including free WiFi and a solid buffet breakfast. Villas like these go for triple the price in the islands. Fishing nets hung from the roofs is a nice touch. 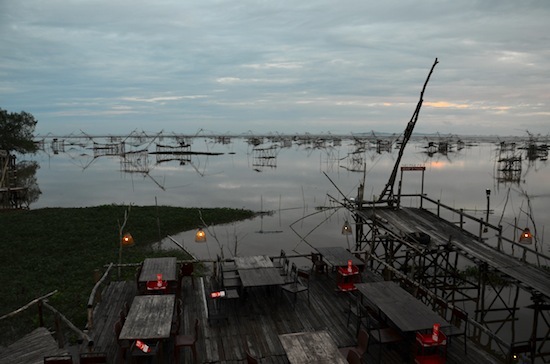 Sri Pak Pra also boasts a popular restaurant with seating on two enormous outdoor decks, under a large roofed dining area with a foosball table and atop a smaller loft that makes for quite a romantic atmosphere when the late-day sun blankets the lake in a soft orange tint. The resort has its own attached fishing net handled by some of the friendly orange-clad staff members. You’re welcome to give it a dip — and yes, the kitchen will grill, fry or steam whatever you might catch. The chefs also do a good job with Southern Thai specialties. Though Sri Pak Pra doesn’t get too many foreign guests, the laid-back receptionists and a few other staff members can speak some English. They offer free bicycles and can arrange longtail boat trips to go birdwatching in Thale Noi or get a closer look at the fishing nets. There’s also a small gift shop selling local products, including deep-fried mini fish that are eaten head, tail and all — better than potato chips for munching on a long car ride. The only potential problem is a location that puts you 10 kilometres south of Thale Noi and 20 kilometres north of Phattalung town. Though the resort can arrange a taxi to pick up guests at the Phattalung bus station, most who stay here come with a vehicle of their own. If you’ve got some wheels and are looking for an excuse to splurge, you won’t find many resorts that are more intriguing than this in South Thailand. Plus 500 baht on weekends. No pool. Plus 500 baht on weekends. Room: Superior double room, low season: 1,500 baht, high season 1,500 baht. Notes: Plus 500 baht on weekends. 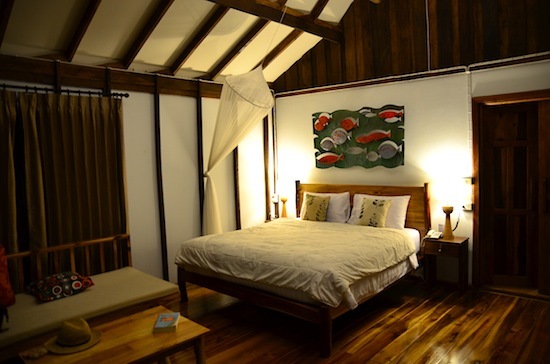 Room: Private pool villa, low season: 2,500 baht, high season 2,500 baht. Notes: No pool. Plus 500 baht on weekends.